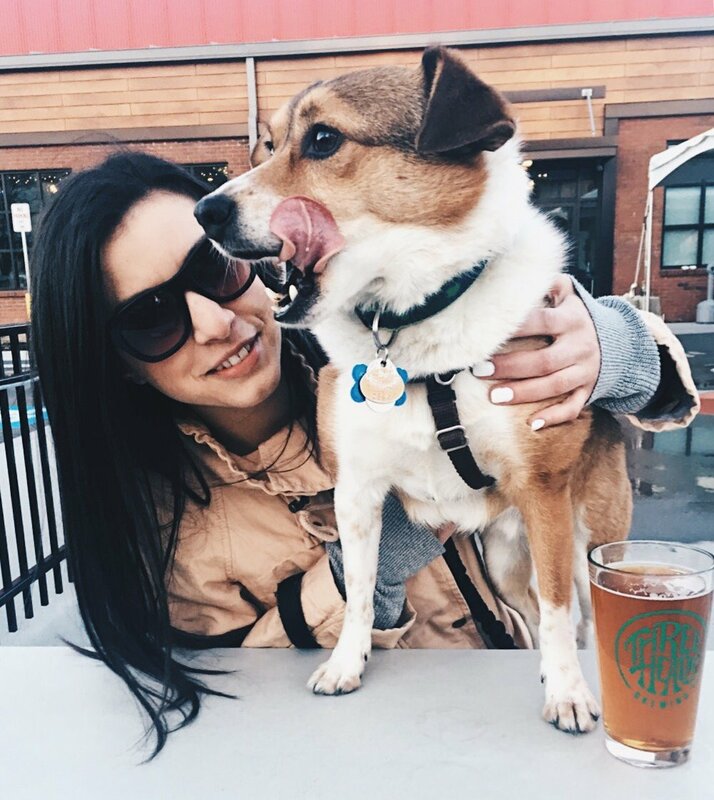 The author's girlfriend, Sarah, and dog, Moosie, on the pup-friendly patio at Three Heads Brewing. We hoisted our glasses and said something sappy about what an amazing day we were having. 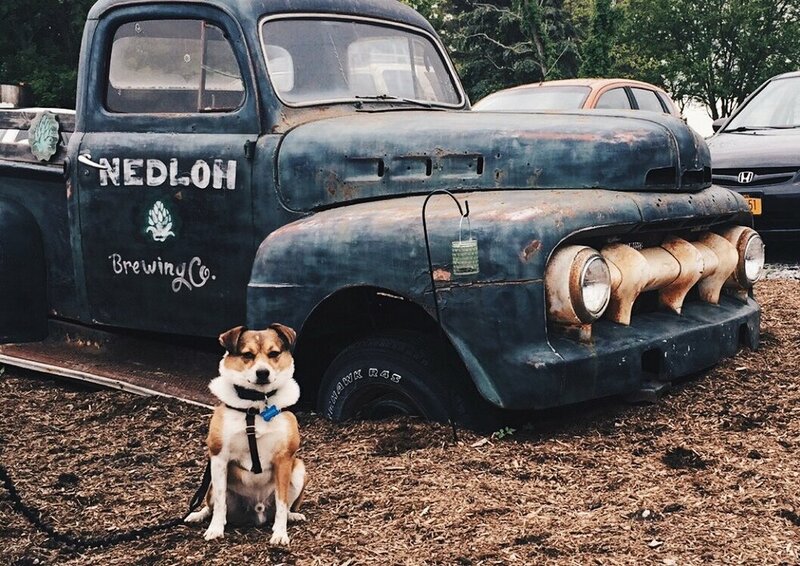 My girlfriend and I were sitting at a picnic table outside Nedloh Brewing Company with a flight of beer in front of us and my pup next to us. As we took in the laidback rural setting and prepared to indulge, we clanked the six-ounce tasters and pulled them close to our noses for a swift whiff. With the first sip, my mouth puckered. I gulped down another mouthful of Funky FLX, Nedloh’s cabernet sauvignon barrel-aged saison and paused. And if I hadn’t read the Insider’s Guide to the Rochester Craft Beer Scene a few days earlier, I wouldn’t have known to stop by the brewery. Created by Linh Phillips of Sir Rocha Says and Carolyn Stiles of Rochester Beer Gals, the guide delivers a compact yet thorough review of craft brewers in the Rochester region, including digestible descriptions to introduce people to new experiences and local beer. The local brewing industry is rapidly expanding both locally and statewide. Since 2011, New York’s craft brewing industry has grown by 542 percent, according to Governor Cuomo’s office. And that’s where the guide comes in. An accurate description of the experience of visiting a brewery—bringing its vibe to life—can be just as valuable as glowing reviews of its beer, explained Three Heads Brewing’s "Minister of Mayhem" Geoff Dale. Andy Cook, owner of Swiftwater Brewing Company, relies heavily on word-of-mouth to drive people into the brewery, which is located in Rochester’s South Wedge neighborhood. “This guide will get people excited to cross each brewery off their to-do list,” he said. Cook sees social media and online review sites as an extension of word-of-mouth in the digital space. The work of bloggers and online influencers to share breweries’ stories helps accelerate the process, getting the word out wider and faster. The brewing industry in the Rochester region and across Upstate New York began its surge when consumers started demanding more locally made products and unique experiences. The catalyst was New York State’s work to update regulations, approve new laws and tax credits and provide funding. However, to truly establish this region as a craft-brewing powerhouse, it will take sustained efforts to promote brewers locally and expand awareness of our industry beyond the borders of our region and state. By introducing consumers to new local beer experiences, the guide has the potential to help shape brand ambassadors and Finger Lakes beer evangelists; the type of people who will post pictures of their beer in front of landmarks on Instagram and motivate their friends to expand their beer horizons. However, the long-term impact of all of this work to create and promote Rochester-made beer has the potential to go beyond tourism. The guide itself is organized, easy-to-access, quick-to-read and mobile-responsive. It’s now another ingredient in the mix of activities, assets and activists brewing a vibrant craft beer industry and contributing to local economic growth. That’s how I used it, and it worked—I found beer I liked and an experience I’ll remember, and a brewery gained both a customer and ambassador.